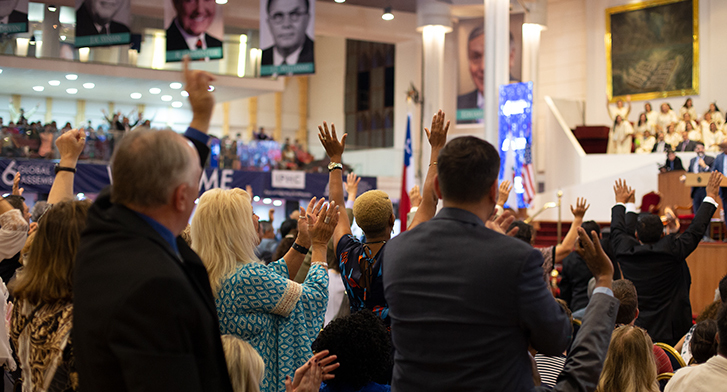 The third and final day of the IPHC 6th Global Assembly in Santiago, Chile, Friday, February 22, 2019, began with a moving time of praise and worship in six languages. 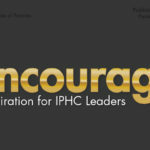 Throughout the day, the Holy Spirit called the IPHC to thrive as a People of Promise. Bishop Garry Bryant, executive director of Evangelism USA, began the day with a report on the state of the U.S. church. 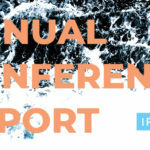 After sharing sobering statistics from the North American church in general, Bishop Bryant declared that the dismal condition of the church in the USA does not have to be the story of the IPHC. The IPHC in the United States can thrive and increase in the power of the Holy Spirit to realize the goals of Arise 2033. 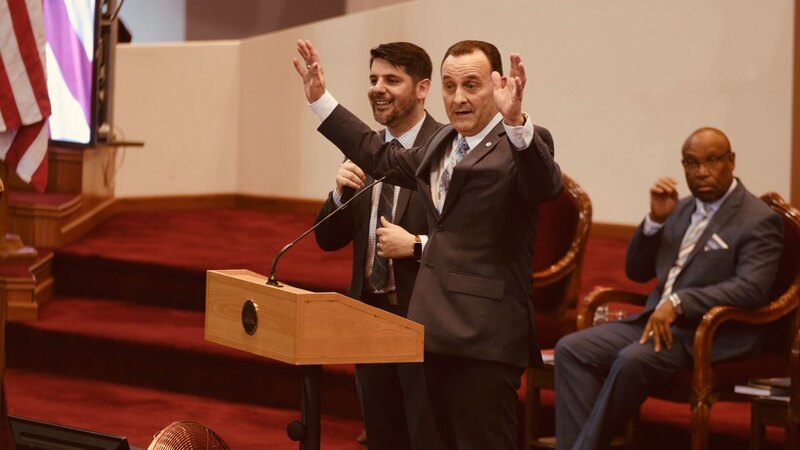 These U. S. goals include planting IPHC congregations in 75 percent of the counties, establishing 200 churches among immigrant communities, and launching house churches in major cities by 2033. 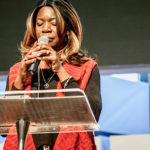 Bishop Bryant proclaimed that Evangelism USA will be driven by biblical mission, denominational vision, and Spirit-filled passion for the 328 million people in the USA who need a church to contend for their souls. Bishop Adonis Gato Cruz of the IPHC in Cuba challenged the delegates to thrive in the midst of political persecution. Using Jeremiah 29:1-7, Bishop Cruz reminded the church that God has historically called his people to prosper in the land of their captivity and during times of crisis. Though this prosperity may be restricted physically, it can be abundant spiritually. Bishop Cruz admonished the delegation not to be distracted by what governments do but stay focused on and committed to what God does in our nations. Dr. Valeriy Reshetinsky, the pastor of Christian Hope Church in Kiev, Ukraine, spoke from Luke 10:1-2 and Matthew 16:13-20 concerning God’s desire to use the church as a tool to raise up and send out laborers for the harvest. Dr. Reshetinsky urged the delegates to seek God for Spirit-given revelation, prophetic identification, and confident faith. 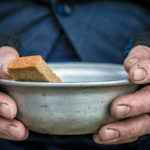 Jamie Dunning, People to People Ministries coordinator in Kenya, described how he is developing patterns of strategic investment rather than ongoing aid to foster thriving ministries and leaders. Rev. Dunning shared several strategies he has successfully implemented in Kenya and Ethiopia for developing investment partnerships between donors and national ministers to generate sustainable income for future success. In addition, IPHC youth led the entire delegation in focused prayer for children around the world. The Holy Spirit conveyed a common theme throughout the morning session in the concept of “thrive.” The IPHC can and must thrive in every condition and setting across the globe. Arise 2033 was not given to a dead church but a thriving church. God gave us these goals to grow, bloom, blossom, and produce a harvest! 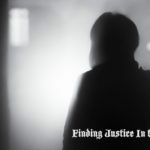 We will demonstrate the reality of our identity as a Place of Hope and People of Promise by thriving in the midst of domestic adversity, political persecution, and financial hardship to realize reconciliation, triumphant growth, and financial sustainability. 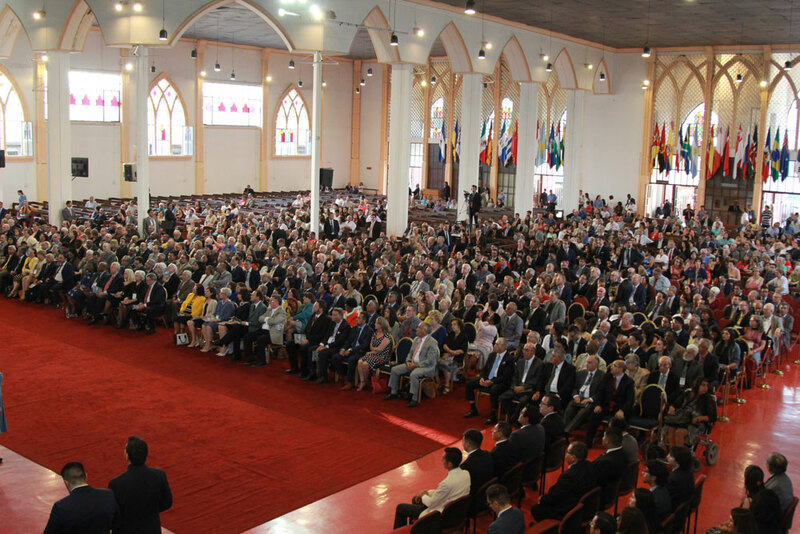 The IPHC 6th Global Assembly concluded with an evening service on Friday, February 22, 2019, at the Evangelical Cathedral of Chile in Santiago. 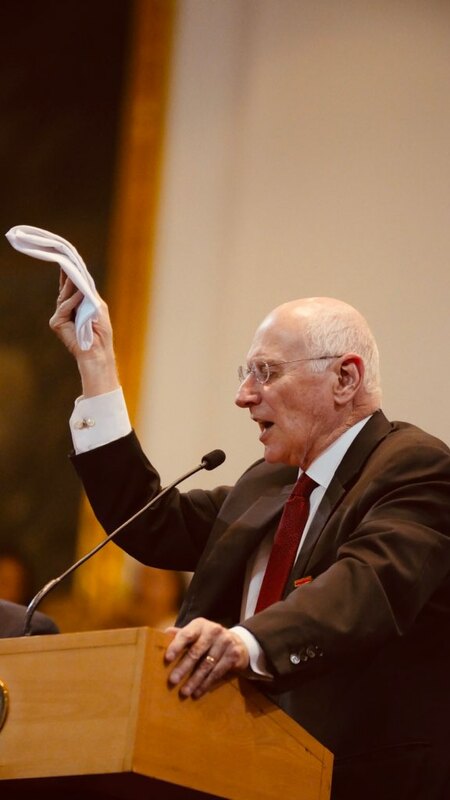 Bishop Eduardo Duran Castro, the presiding pastor of the Cathedral and president of the First Methodist Pentecostal Church of Chile, called the congregation to worship with prayer and reading from Acts 3. 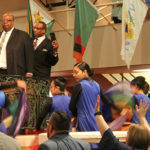 Bishop Garry Bryant, executive director of Evangelism USA, led the congregation in celebrating the generational and ethnic diversity represented among the delegates and attendees. 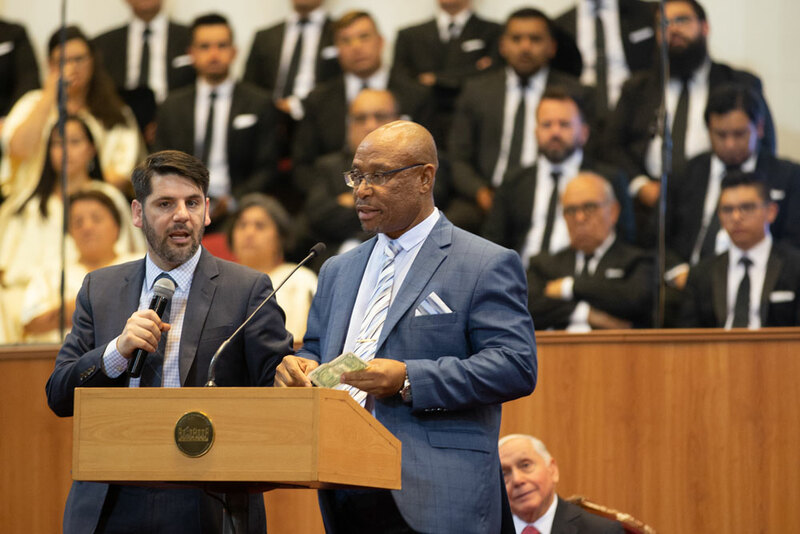 Bishop Duran invited Bishop Jamir Fernandes Carvalho of the Wesleyan Methodist Church of Brazil to give a report of this work which began its affiliation with the IPHC in 1983. Since then, the Brazilian church has sent out 243 missionaries to Portuguese speaking nations around the world. Bishop Joel Dibetsoe of the PHC in South Africa shared a message from Hebrews 10:23 and 2 Corinthians 1:20 about a “People of Promise.” He declared that we are a people who thrive on the promises of God found in Scripture. We stand on Scripture not because it is full of good promises but because the one who makes the promise of the Bible is both able and faithful to fulfill them. Using the imagery from Thursday night, Bishop Dibetsoe reminded the congregation that even a barren woman can walk in confident expectation of increase when she walks in the promises of God. The church may appear barren in certain places and at certain times but we can confidently expect to thrive and flourish because we are a people of God’s promise. The final speaker of the 2019 Global Assembly was Presiding Bishop Dr. Doug Beacham. He began by leading the congregation in prayer and laying hands on Bishop Hernando Brochero for the political turmoil in Venezuela, and on Rev. Steven MacDonald for the healing of Bishop Gordon McDonald of Canada. Dr. Beacham brought a message concerning the IPHC as a People of Promise from Isaiah 54:1-5. He declared that Jesus is our husband and that we don’t have to live in shame. The love of Jesus is more than sufficient to cover anything from the past and fulfill the promises He has made. Dr. Beacham challenged the IPHC to remain committed to Scripture as a primary core value since our promises arise from the Bible. He directed the IPHC to discern between change and transition. He explained that change is common and constant, but transition is how we choose to respond to the change around us. Dr. Beacham encouraged the church to celebrate the past but remain confident in the future by intentionally identifying, inspiring, equipping, establishing relationship with, and releasing the next generation. 1. Pray to the Lord of the harvest for the largest wave of Christian workers that the IPHC movement has ever seen. 2. Beginning now, for the next 14 years, be sensitive to the work of the Holy Spirit to call people to salvation and ministry. Dr. Beacham immediately asked those young people in attendance who are sensing a call to ministry to stand. Over 40 young people responded and received prayer. 3. Make a commitment to equip and release workers. 4. Ask the Holy Spirit to give us a deeper appreciation for and connection with those whom we co-labor. 5. Seek God for needed strategies for the next 14 years.